NEW YORK (AP) — An SUV smashed into a concrete pillar and flipped over before bursting into flames early Sunday, killing three women and two children and reducing the vehicle to a mangled mess. The driver, along with another adult and a child inside the vehicle, survived and were hospitalized. The 2008 Mercedes Benz SUV was traveling east on Atlantic Avenue in the New York borough of Queens around 3:15 a.m. when it hit a pillar supporting the AirTrain to John F. Kennedy International Airport, authorities said. 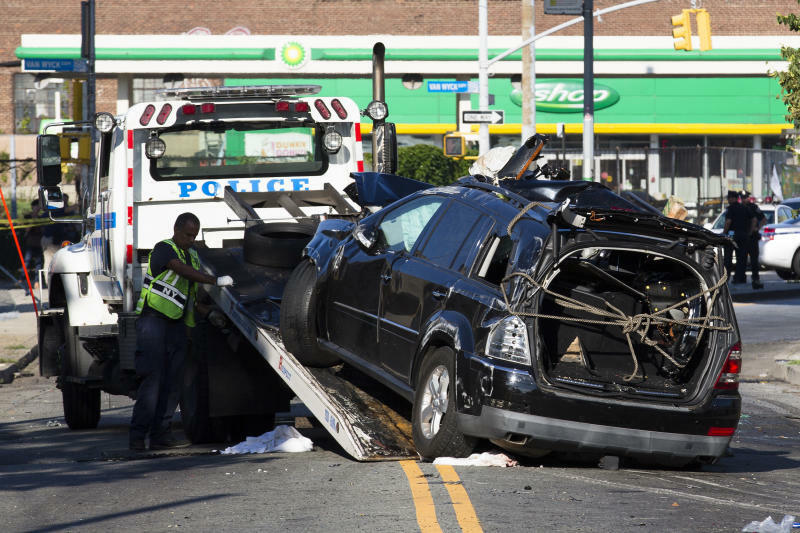 The vehicle appeared to speeding and blew through two red lights, police and witnesses told the Daily News of New York. 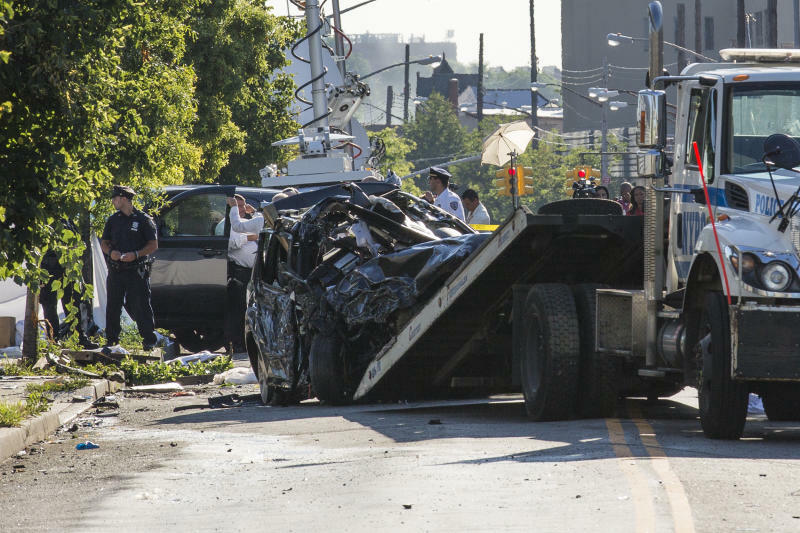 A motorist traveling north on the service road of the Van Wyck Expressway told the newspaper that he had a green light and was crossing the intersection at Atlantic Avenue when the 2008 SUV nearly hit him. "All I saw was headlights," Ryan Jardine, 24, told the News. "She ran the light, almost hit us and then hit the pole." He said the driver swerved to avoid the other vehicle. "We saw the car just hit the pole and it went into a somersault," he said. "It just started flipping. It was horrible." Three adult passengers, all women, were declared dead at the scene, as were an 8-year-old girl and a 9-year-old boy. Chief Stephen Browne of the Fire Department of New York called it the worst single car accident he had seen in his 26-year career. "To see this much human life devastation in a single-car accident on a side street is not normal," he told the News. Firefighters extricated victims with jaws-of-life tools while putting out the fire. The 8-year-old girl was thrown from the vehicle and found dead on the ground about 10 feet from the SUV. One of the three dead women was still wearing her belt in the front passenger seat, while another was thrown from the SUV and pinned underneath it, officials told the News. The driver, a 45-year-old woman, was undergoing surgery at Jamaica Hospital, said Joann Ariola of the hospital's public affairs department. She said a 7-year-old boy was in stable condition in the pediatric emergency room, and a man was in stable condition and likely to be treated and soon released. Police said that man was 26 years old. The group had earlier been at a banquet hall where an association of Nigerian immigrants gathered from around the country as part of the Arondizuogu Patriotic Union National Congress of North America, attendees told The New York Times. The group talked about improvement projects they were working on in their homeland. No identifications have been released.